Bird hunting in Southern Africa is extremely popular with many different species available to be hunted. A bird shooting safari can easily be combined with a plains game hunt or a dangerous game safari. South Africa offers the bird hunter more than 20 different species of game birds. The best time for bird hunting is during the open seasons in most of South Africa's provinces and falls and runs from June to the end of August. 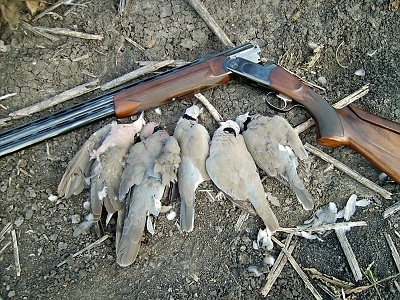 Bird hunting is best done in small groups between two and four hunters. Bird species hunted in South Africa are grouse, quail, francolin, guinea fowl, various species of dove and pigeons, Egyptian Geese and Spurwinged Geese. Egyptian and Spurwinged Geese can make for very challenging hunting. Duck species hunted are Yellow Bill, White Faced Whistling, and the African Shell Duck. Several species of Teal are also hunted and they are a real challenge for even the most accomplished shot gunner as they are extremely agile. All bird species are not available in all the hunting areas and provincial hunting regulations vary on the daily bag limits of different species from area to area. Certain species that are allowed to be hunted in certain areas may be protected in others. Be sure to clearly indicate what species you wish to hunt when booking your bird hunting safari so we can make sure to match you to the right product. For a successful and satisfying bird hunt allow for 5 to 6 hunting days per safari. Genesis African Safaris only uses outfitters who practise natural hunting and do not breed birds for driven hunting as is common practise in the United Kingdom for instance.